While the latest academic reports from the LA Unified school district were positive overall, school board President Steve Zimmer expressed frustration at some of the data presented at Tuesday’s board meeting and said he foresees potential problems ahead. 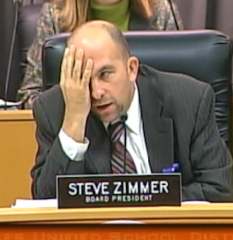 Zimmer asked for a breakdown of how many students are graduating with D grades and in what subjects. He also wanted to know if the district is notifying local colleges and universities to let them know that the second-largest school district in the country is hiring academic counselors again. Those academic counselors will also help students with their credit recovery program and push them toward graduation, he noted. Although some of the academic scores came close to the district’s targeted goals, some were sorely lacking. Cynthia Lim, the executive director of the Office of Data and Accountability. 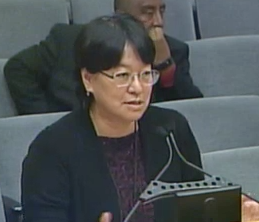 For example, every high school student is supposed to have an Individualized Graduation Plan (IGP), but only 59 percent do, said Cynthia Lim, the executive director of the Office of Data and Accountability for LA Unified. “We had a few glitches in the system,” Lim explained. 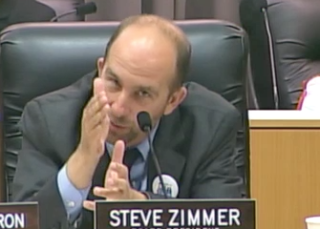 At one point Tuesday, Zimmer turned to the new student school board member, Karen Calderon, and asked if she had an Individualized Graduation Plan. No, she didn’t, but she said she has a good relationship with the counselors at her high school. Also, about 38 percent of the district students taking the college-level Advanced Placement Exams received a 3 or higher, making them eligible to get college credit, Lim said. The target that the district is striving for next year is 40 percent. “We have some improvement needed there too,” Lim reported. The school district also wanted at least 48 percent of graduating seniors to pass the A-G class requirements with a C grade or better. They hit 42 percent. Zimmer pointed out that the district had laid off academic counselors in the past that were supposed to be helping students achieve success in graduating and steer them toward college. He said he fears that not enough academic counselors are graduating from local universities, and the district will suffer. Chief Academic Officer Frances Gipson said the district is working with Title 1 money to help schools that need extra resources. She said the district is also encouraging students to consider a counseling career. She said the district is creating more pathways to accelerate student graduation and encouraging dual enrollment with community colleges. They are also working closely with USC, UCLA, Cal State and schools to share resources and produce the best graduates.